A “Special” Church built at Concordia “Dome C” – W.A.P. Beautiful initiative, the one of building a Church in Antarctica! I did it myself, by reproducing with ice, the Dome Church of my town (Muggia, in the Province of Trieste) at Base Concordia “Dome C” during my overwintering stay on last 2010-2011 Antartic Campaign. 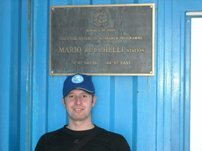 Daniele Kalicek is a young Italian Researcher; he works for the Department of Geosciences at the University of Trieste, specifically in the laboratory of isotopic Geochemistry. 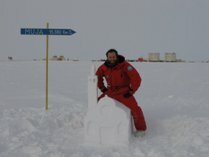 Daniele did winter over at Concordia “Dome C”, the French-Italian Multinational Base in Antarctica where he was involved in the maintenance of the equipments used to make aerosol analysis, collecting samples for scientific studies. He follows several plans in the field of glaciology that involve several Universities and agencies. Another of his task down there was to carry out every day, aerosol atmospheric samplings, snow and precipitations, observing and record data weather. Daniele said: The nearest Base is the Russian Vostok, about 600 km from Concordia “Dome C” so we must be able to take care of ourselves, particularly during the winter over time. The insulated atmosphere and the extreme conditions did fascinate to me, and perhaps, this one is one of the more extreme adventures that a man can make. Thanks Daniele, you did great… it was a nice way to say a prayer, Lord will be be certainly grateful of your job!